National Adjusters are currently assisting Mexico Beach homeowners, business owners and condominium associations with their claims, our office is near by in Port St Joe. If you have Hurricane Michael damage and want to receive the best possible settlement, call: 850-895-1133 we offer free insurance claim evaluations and consultations and there is no out of pocket for us representing you. Our team is currently helping Mexico Beach home owners, if you would like to schedule a consultation please fill out the contact form here: CONTACT US or call. There are many adjusters in the area but none with the experience that our company has. We have been adjusting Hurricane and natural disasters dating back to early 2000's. We have noticed an influx of new adjusters and out of State adjusters flocking to the Panhandle to assist. You can check how long an adjusters has had their Public Adjusters license or which State they are from here: https://licenseesearch.fldfs.com/ The license number of Bryan Thomas is P024587. Call for other areas not listed! Mexico Beach was incorporated in 1966. 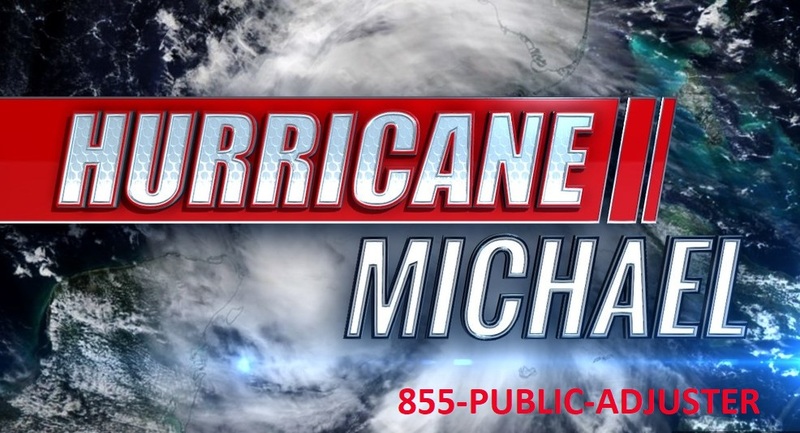 Hurricane Michael made landfall near Mexico Beach on October 10, 2018, just before 1 p.m. local time with maximum sustained winds of 155 miles per hour (249 km/h), just 2 miles per hour (3.2 km/h) short of Category 5 intensity. The Category 4 hurricane made history as the third strongest (by pressure) and fourth strongest (by wind speed) landfalling storm in the continental United States.The storm caused extensive damage to the community, and to the nearby Tyndall Air Force Base. Many homes were totally destroyed. Brock Long, the FEMA administrator, told CNN that Mexico Beach was "wiped out" and referred to the community as "ground zero".The hurricane’s eye-wall passed directly overhead, severely damaging nearly every building and leaving many a complete loss. The elementary school and city hall were among the buildings devastated;the pier washed away, and the water tower was knocked down. A report by the State indicated that roughly 285 people in Mexico Beach had declined to evacuate the area, although some of those may have left before the peak of the storm. The death toll had not be determined as of October 12, but Brock Long of FEMA was not optimistic: "Very few people live to tell what it's like to experience storm surge, and unfortunately in this country we seem to not learn the lesson". At that time, Mayor Al Cathey told residents it might be months before electricity, water, and plumbing are restored. Mexico Beach waterfront in 2013. Mexico Beach is located at 29°56′29″N 85°24′23″W. According to the United States Census Bureau, the city has a total area of 1.8 square miles (4.7 km2), of which 1.8 square miles (4.6 km2) is land, and 0.04 square miles (0.1 km2), or 2.84%, is water. Mexico Beach is located in the Florida Panhandle. As of the census of 2010, there were 1,072 people, 563 households, and 320 families residing in the city. The population density was 595.6 inhabitants per square mile (233.0/km²). There were 1,852 housing units at an average density of 1,028.9 per square mile (402.6/km²). The racial makeup of the city was 93.1% White, 1.9% African American, 0.4% Native American, 0.7% Asian, 0.0% Native Hawaiian or other Pacific Islander, 0.8% some other race, and 3.1% from two or more races. Hispanic or Latino of any race were 2.6% of the population. There were 563 households out of which 11.4% had children under the age of 18 living with them, 47.8% were headed by married couples living together, 6.7% had a female householder with no husband present, and 43.2% were non-families. 38.4% of all households were made up of individuals, and 15.6% were someone living alone who was 65 years of age or older. The average household size was 1.90, and the average family size was 2.43. In the city, the population was spread out with 11.3% under the age of 18, 5.4% from 18 to 24, 16.7% from 25 to 44, 35.5% from 45 to 64, and 31.2% who were 65 years of age or older. The median age was 55.1 years. For every 100 females, there were 94.2 males. For every 100 females age 18 and over, there were 95.3 males. At the 2000 census, the median income for a household in the city was $31,950, and the median income for a family was $40,163. Males had a median income of $30,278 versus $23,125 for females. The per capita income for the city was $22,871. About 8.1% of families and 11.5% of the population were below the poverty line, including 18.8% of those under age 18 and 10.7% of those age 65 or over. Property damage to homes and commercial real estate in Panama Beach is a major fear when hurricane season rolls around each summer. Florida’s history is filled with hurricanes that have caused havoc for homeowners. The severity of these storms have caused insurance companies to take exacting measures towards coverage and policies. It’s very important that property owners connect the best public adjuster to gain a clear understanding about their insurance coverage for hurricane damage. Our Florida Public Adjusters and Insurance Appraisers have adjusted thousands of Hurricane claims over the years ranging from multi million dollar commercial losses to smaller residential hurricane claims. When it comes to Hurricane damage you will want to only hire adjusters with the experience level and knowledge needed to obtain the best possible insurance settlement. 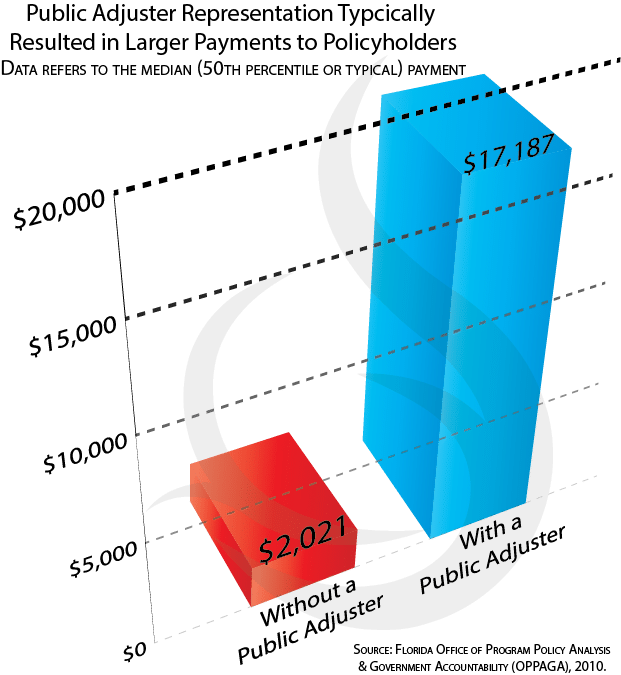 Make sure the adjuster has been a LICENSED PUBLIC ADJUSTER for at least 10 years, make sure they have the necessary Catastrophic adjusting experience (especially flood). Make sure they have a 5 Star rating or better with the Google and Yelp and lastly, make sure they are members of FAPIA – Florida Association of Public Insurance Adjusters www.fapia.net. It should be known that only handful of Public Adjusting firms will fall under these qualifications but its very important that they do.